Technically this box is usually Tim’s box but I’ve taken a few of the items from his box this month and wanted to share and review. Bespoke Post operates a lot like JewelMint does in the sense that you have the option to skip a month but it’s mixed with a set box of curated style and discounted products like Birchbox or Ipsy. Each box has a strong theme to tie the items together whether that’s coffee (link to Tim’s review) from the Bespoke Post “Roast” box or getting a closer shave with the Shave set. Each Bespoke Post box is $45 and includes products that are often worth way more than that. Like JewelMint, you DO have to remember to skip a box but you will get an email reminder as well as information about that month’s box. There are definitely some Bespoke Post boxes that are more unisex than others (if Tim hadn’t bought the Bespoke Post Roast I would have … oh wait … I think I started him on this subscription so I may very well have paid for that box!) But the intended audience IS men. You can take a look through past “boxes of awesome” here. To me this scarf looks very much like something that would sell at Madewell or Fossil but even better quality and my first thought when I saw it was that it looked like it came from Anthropologie. 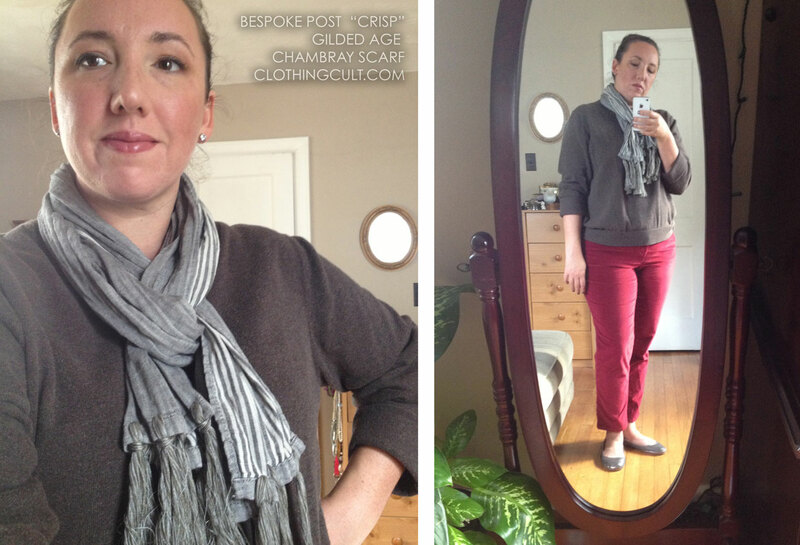 The scarf’s style is a bit laid back but still a classic style given that it’s chambray. The material is excellent and you can see the quality in the details like the sewn edge and how they’ve added the tassels. I expect that this scarf will last a very long time. Pictured above: Gilded Age Chambray Scarf, Lands End cashmere cotton blend sweater (this sweater was also Tim’s – accidentally run through the dryer so it shrank, sleeves rolled up so it didn’t look too baggy on me), Kohl’s Sonoma life + style red velvet ankle pants, Ugg leather and shearling Antora metallic pewter ballet flats, faux diamond bezel earrings from Curacao, and barely in the picture, the new hair donut bun. 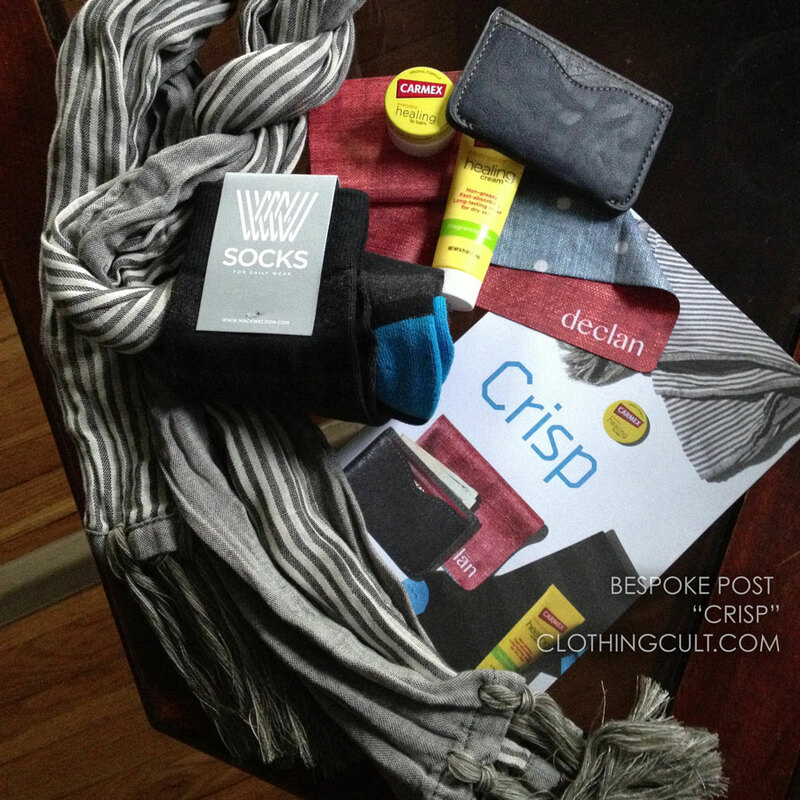 My next favorite item in the Bespoke Post box was the Microfiber Sheet from Declan. (Show in the first picture at the top.) It had a printed chambray pattern on it and it’s EXCELLENT for wiping down electronics. Even better than my last microfiber cloth (which Tim accepted as a consolation after I grabbed this one from his box.) Declan has a lot of great patterns on their website. Again, good quality product… I keep thinking that if they made them square they would nicely double as pocket squares for Tim. The one item Tim is for sure getting from this box is the Charcoal Striped Socks from Mack Weldon. There’s no way they would fit my feet! 🙂 And he needed some more nice dress socks anyway. These are nice and they appear to be a good quality. We’ll see how they hold up and if they can beat out the golden toe socks he owns. Anyway – another great box from Bespoke Post Box of Awesome! Like what you see? Sign yourself (or your man) up for a Bespoke Post Box! coupon code “WINGMAN? should save you 25% off your first box!